OVER THREE DECADES AND STILL GOING STRONG! The People: Without them, NOTHING happens. With the right ones, something INCREDIBLE happens. Our energetic, experienced and cheerful management and staff is without parallel, anywhere. Follow this Great Scale Model Train Show People link, to meet them. The Basics: The original Great Scale Model Train Show and companion Hi-Rail & Collectors Train Show are held in Timonium, MD in February, April, June, and October. The same admission that formerly gave you only the Great Scale Model Train Show now includes the new Hi-Rail & Collectors Train Show at no extra cost. Two huge shows for the price of one! Scale Models: This is the largest show in the country dedicated to "scale" model trains. So-called scale trains are those which reasonably (or exactly) replicate the real world equipment and scenic features. High Rail: This rapidly expanding hobby interest is fueled by the new lines of excellent Hi-Rail models, and also embraces the traditional hi-rail and tinplate that originally made model trains so popular. See and buy Lionel, American Flyer, and the other train collectibles as well as all the newest M.T.H., Rail-King, new Lionel, S Helper Service, and other modern Hi-Rail products. Also see many operating displays of both old and new Hi-Rail and tinplate trains. Whether for vast lines of merchandise, expertise and help, or just the experience of viewing the visually stunning and highly detailed operating layouts, there is something here for everyone. The merchandise at our shows includes all the common scales from Z to large scale. And there's much more than just the trains -shop for scenery, tools, electronics, parts, videos, books, building supplies, software, display cases, railroad art, even hats, shirts, mugs and souvenirs- everything you could want to make your hobby (or the hobby of someone on your gift list) more enjoyable! 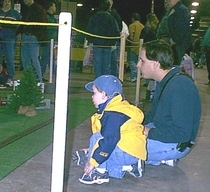 The family friendly shows also feature a supervised Thomas themed play area for little ones, and activities to capture the imagination of 'tweens. The Venues: All but the June show are held in the gargantuan "Cow Palace," a 3 and 1/2 acre building which houses our colossal vendor and layout display areas. But in June, alas, it can be hot. Thus we move to the smaller "Exhibition Hall" for the comfort of air conditioning. Click the link at left for Show Dates, Directions and Map where you may download a printer-friendly map that will help you locate both buildings easily. The Jury is in: The Management and Staff of our shows "jury" the content of each show. Prior to registering a vendor, display or clinic for our show we ensure that the content is appropriate and as represented. We also monitor all participants during setup to ensure they adhere to the standards of content agreed to at the time of registration. The Doctor is in: From novice to expert, every modeler can benefit from special instruction in various aspects of the hobby. Vendors and specialists produce clinics which explain and illustrate the best and most economical practices for everything from wiring to scenery, to laying track to making trees. The Elephant is In: Have a few items to sell? Drop them off at the White Elephant tables and enjoy the rest of the show. Your cost is a reasonable commission of 15% - applied ONLY when the item sells. And check the tables often for bargains; merchandise is always changing as show patrons drop off their items all weekend long! The Hunger is OUT: And don't forget about the food! Turkey, pork and beef are smoked right at the show and served up as generous slabs. Together with regional seafood favorites, fries, onion rings, snacks and refreshements, you won't go hungry. Many visitors say the food alone is worth the price of admission! Park Place: Parking on the fairgrounds is free! Making History: The Great Scale Train Show is the creation of partners Howard Zane and Ken Young. Looking forward to pursuing activities in their retirement, they accepted the offer of new owners J. Scott Geare and Mike Militello, who assumed ownership and operation in February, 2014, and who are sworn to uphold the high standards for which the shows are famous.